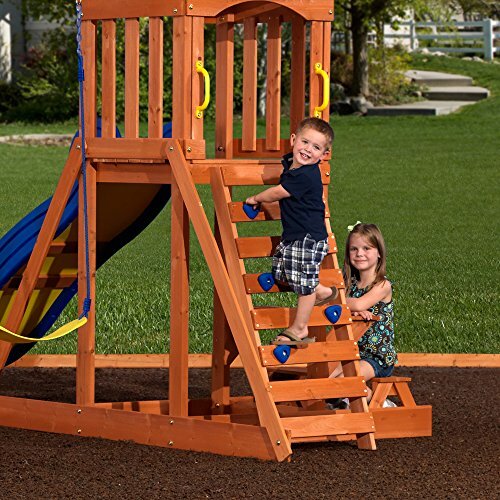 The Backyard Discovery Dayton Cedar Wooden Swing Set combines modern functionality with the flawless aesthetic and durability of wood. 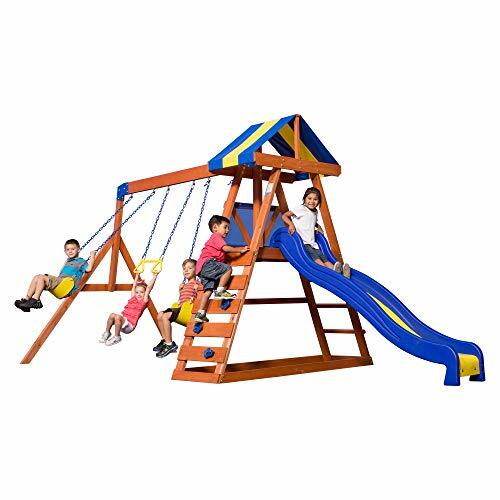 Comprising all you could wish from a best in class pick, this swing set can meet the needs of most kids, and it fits perfectly even in a smaller backyard. This affordable swing set can seamlessly bring summertime fun to your yard. 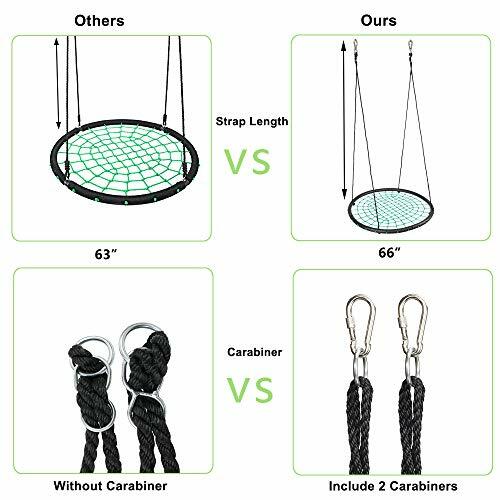 It features three total swings – two belts, and one trapeze style – designed to help kids develop strength, balance, and motor skills. The 8-foot tall playground slide is super-safe even for the youngsters while offering enough speed for the older kids. Toddlers will also enjoy spending hours in the sandbox located beneath the upper deck, shaded from the sun. For older kids who crave for livelier entertainment, the set boasts a rock climbing wall ladder, while a standard ladder on the opposite side gives quick access to the slide to children who don’t feel like climbing walls. 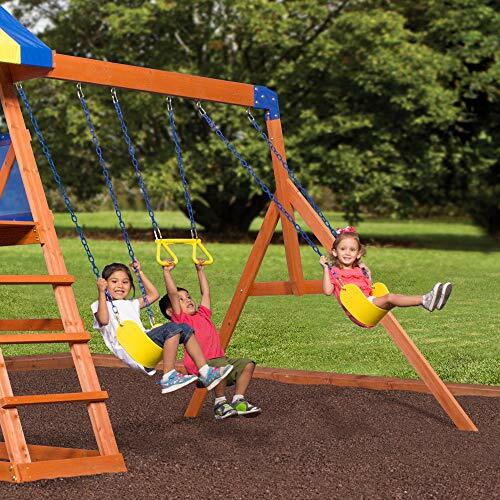 Made from quality materials, this swing set promises durability and reliability. 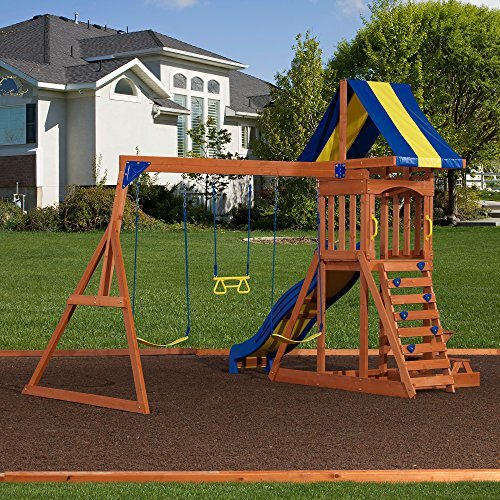 The angled frame adds stability, while the whole play set incorporates a wealth of safety features, including a mesh protector for the deck and heavy-duty swing brackets. 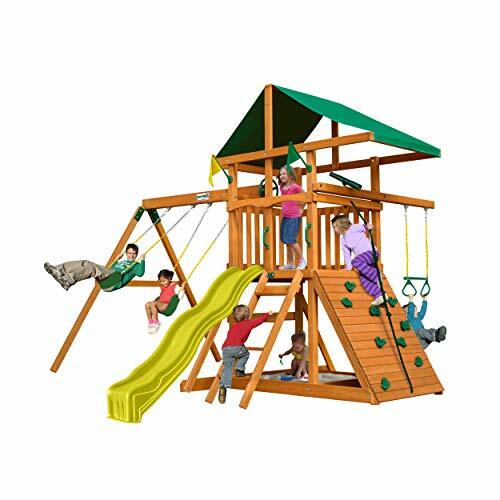 The frame is made of cedar wood treated with chemical-free stain, it’s weather resistant, and complies with all ASTM safety standards, so you can let your kids enjoy the outdoors in all peace of mind. 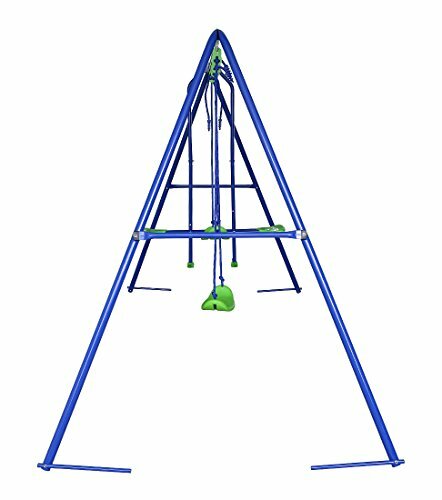 The Inspiration 250 fitness playground by IRONKIDS is one of the best swing sets for kids between 3 and 8 years old. 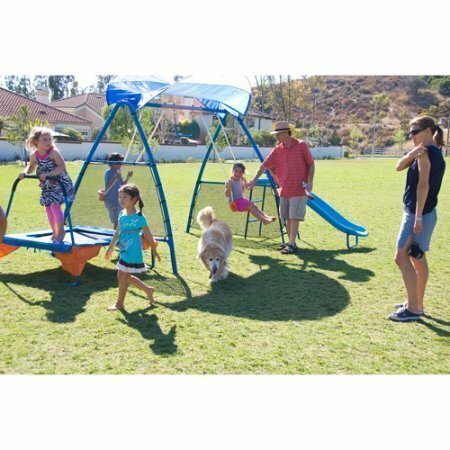 It is designed to keep up to 6 children occupied for hours and incorporates swings and activities able to entertain groups of all ages. 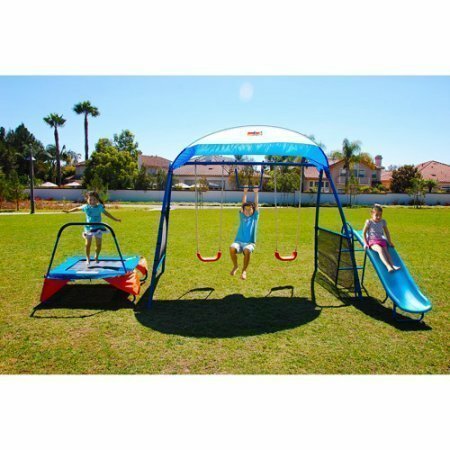 Besides two belt swings and a monkey bar attachment, the unit comes with a fitness jumper trampoline your kids can have fun on while improving their balance and full body coordination. Another nice feature is the fitness slide made of solid polypropylene. 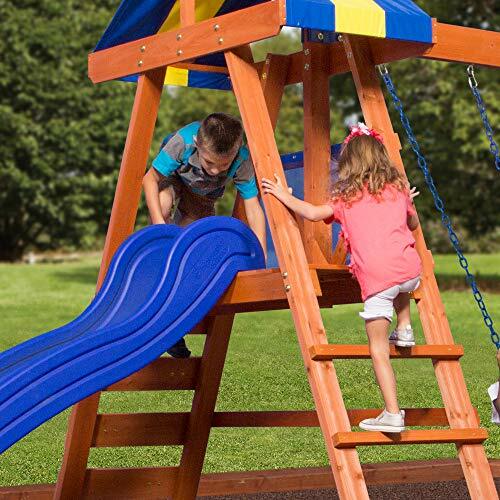 The height of the slide makes it a safe option for kids of all ages, while the UV-treated material resists all weather conditions without bristling. 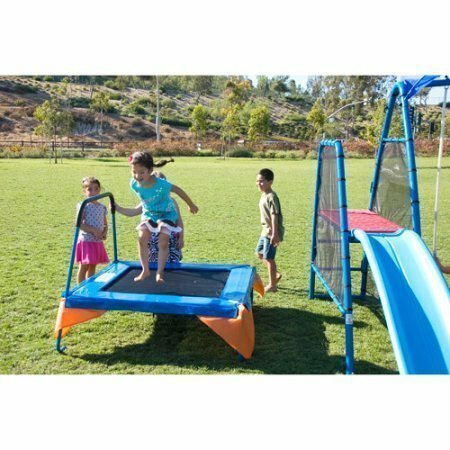 Regarding the technical aspects of this set, Inspiration 250 is made of powder-coated tubular steel with support posts for the trampoline, ladder, and slide. It is perfect for small backyards thanks to its compact dimensions of only 13’6’’ x 10’3’’ x 6’5’’ inches when the slide is on. Compared to our top pick, this set is easier to install and lighter. You can move it from one place to another easily as long as you secure it to the ground properly before letting your kids play. Furthermore, an included canopy comes as a great addition for afternoon fun. 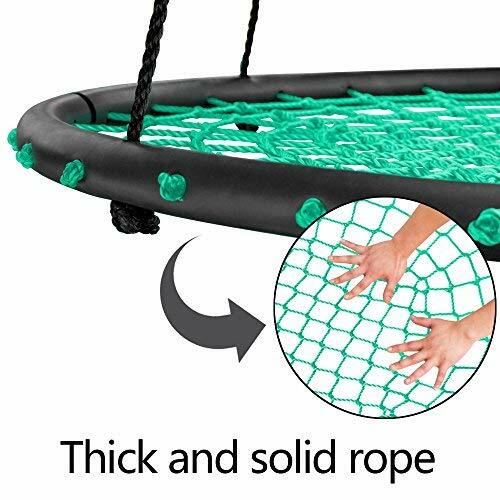 JOYMOR Spider Web Round Rope Swing may not be a swing set in the true meaning of the word, but it’s affordable, easy to mount on another swing set, and ideal for all members of the family. With a weight capacity of 440 pounds and a diameter of 40 inches, this one is great for both you and your kids. It’s also super-easy to install and dismantle. Designed to work universally, it either attaches to a swing or hangs from a tree. Relocating or storing it is also easy, thanks to the collapsible structure you can take down in minutes. The comfortable seat is large enough to provide a safe swinging experience to up to two kids or an adult. Whether you need a place to lounge while watching your little ones or want to upgrade your swing set, this rope swing can live up to the expectations. 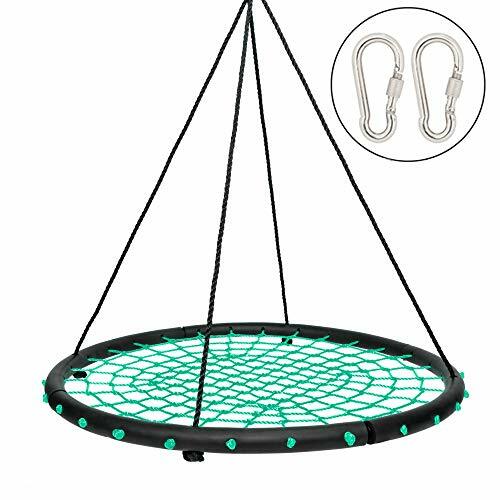 We also liked that the swing comes with all hardware needed for mounting, including carabiners, screws, and a wrench. An adjusting rope also helps you set it at the desired height so that it can provide a safe experience even for the youngsters. 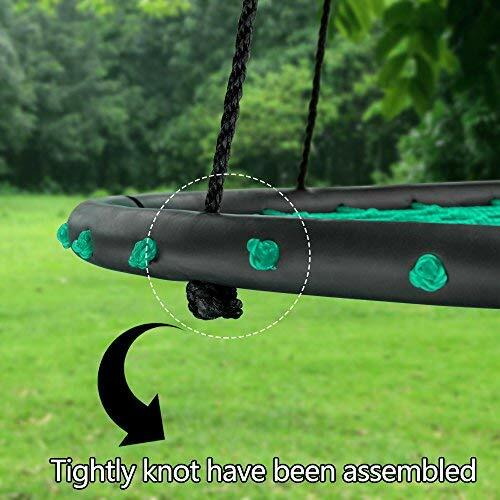 Stable, firm, and durable, this swing can provide hours of backyard fun to generations of users, and it even comes with a convenient satisfaction guarantee. An inexpensive and risk-free purchase we can only recommend. 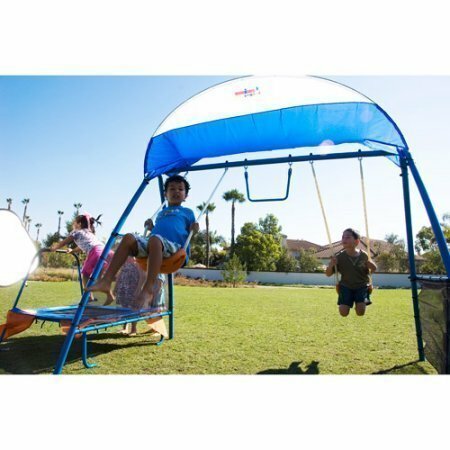 If you’re looking for the best balance between value and money, then the Metal A-Frame Two Seat Swing Set by BestValue Go could be the right one for you. Designed to entertain up to four kids at a time, this swing set is perfect for children between three and eight years old, weighing up to 100 pounds each. 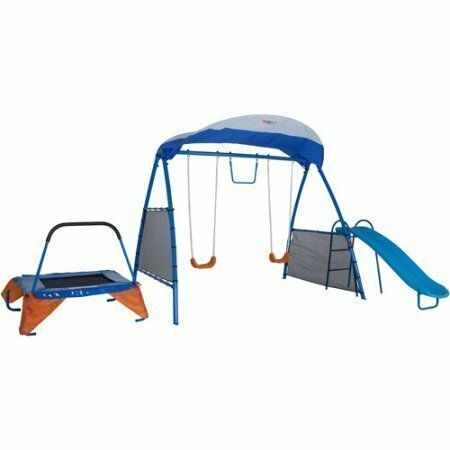 Easy to assemble and small enough to fit in a small backyard, this set also promises to last for a long time thanks to the quality of the components. The frame is made of powder-coated steel tubes, and the unit comes with all hardware necessary for the installation. 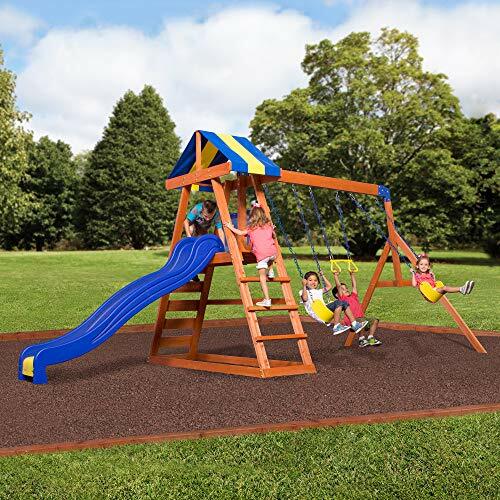 Adjustable ropes and ground pegs allow for a safe mounting, and you will also be able to adjust the height of the swings so that kids of various heights can seamlessly enjoy the benefits of the set. This set comes with two seat swings made of plastic and a see-saw swing that can accommodate two other kids. All plastic components are UV protected to reduce heat retention and color fading. At the same time, the treatment also boosts the resistance of polypropylene over time. Weighing less than 50 pounds, this set is also easy to move from one place to another, while assembling and dismantling should take less than a couple of hours. The Movement God Metal Swing Set is similar in many ways with our best value pick, but a slightly higher price tag and fewer swing adjustability options determined us to include it as a runner up. This set is also made from powder-coated steel tubes and has an A-shape frame structure that ensures stability on most terrains. Ideal for up to five children between 3 and 8 years old, the Movement God comes with two plastic swings, a see-saw, and a slide. Measuring 138 x 87 x 71 inches and requiring a clearance of at least 6 feet on all sides, the set may be a struggle to fit in a smaller backyard though. Regarding its capacity, it can handle kids of up to 100 pounds each, for a total weight of 500 pounds. 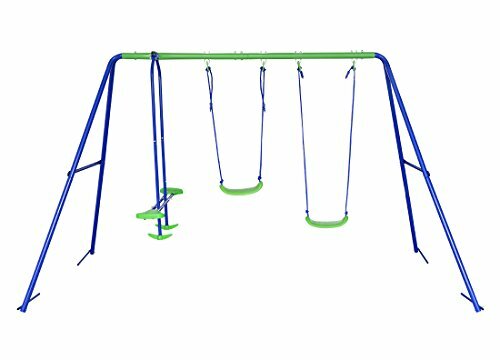 Coming with all hardware and instructions needed for installation, this swing set is also easy to erect or dismantle when not in use. A slight drawback is the fixed length of the swings, although it’s easy to replace the factory ropes with adjustable ones. 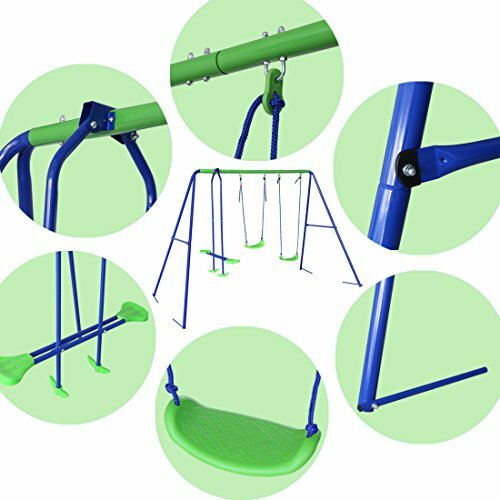 All in all, this is an excellent metal swing set for your kids that meets all ASTM safety standards. Another set we chose to look at was this one from Swing-n-Slide. What we initially liked about this model is that it’s the right size for most small yards. It’s reasonably wide but it isn’t so deep that it won’t be able to fit into almost all smaller yards. 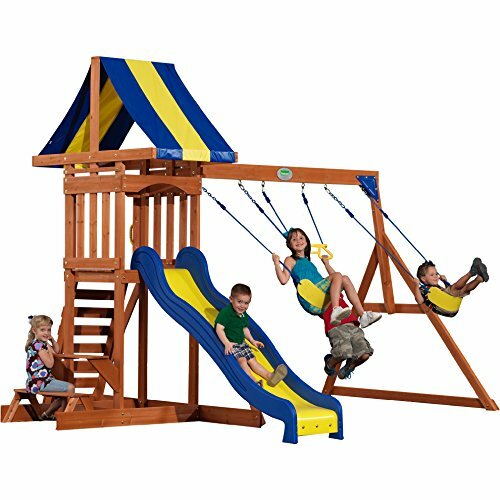 The second thing we quite liked about this swingset is that it’s very reasonably priced. For those who are on a tighter budget and have a small yard, this is an excellent option for you. While quite inexpensive that doesn’t mean that it won’t be a ton of fun for your kids either.For those looking for something small, affordable, and having the ability to grow with your kids this is definitely the set you want to take a look at. It checks a lot of boxes, and while it may not be the fanciest set out there, it’s more than capable of getting the job done. We’ve reviewed quite a few sets from Backyard Discovery and none of them have failed to disappoint us in any way. The sets may end up costing a little more than some of the other basic sets on the market, but their quality and construction always seem to set them apart in our eyes. This set, like all of the others they produce, has quite a few of the things your kids will be looking for a and a few tasty extras. In terms of space, the primary piece isn’t that large, but it’s probably on the larger side of smaller swing sets. It’s something to take stock of before purchasing. 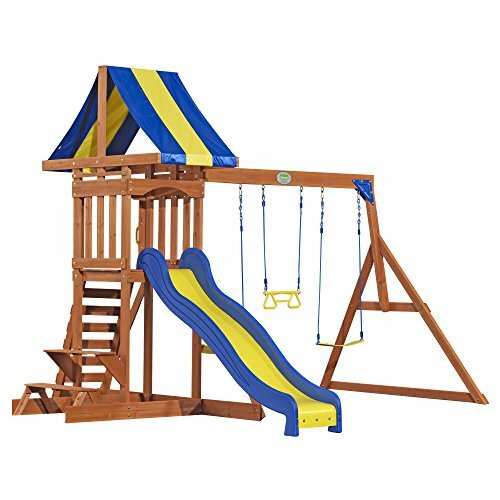 This particular set comes with a few swings, a trapeze swing, a sandbox, a large slide, a rock climbing wall, and a ladder. There’s a lot of things to do here so the kids will be able to play for hours while you can simply stand by and watch them enjoy themselves. This set is also completely made of cedar which makes it a little less of an eyesore than a lot of other options. We realize that aesthetics aren’t probably the primary concern here, but it never hurts to have something that’s not a total mess in the yard. If you have a few extra dollars to spend but still have limited space, this is a fine set coming in. It boasts enough to keep the kids entertained while not taking up too much space and not being an aesthetic disaster. The last set we chose to take a look at is this fine number from Gorilla Playsets. In terms of its rank among the three sets, this one is definitely the biggest and baddest. This set certainly isn’t for those looking to find something on a budget. While this may seem like quite a bit of money for a playset, which it is, this one has pretty much everything you could ask for in what is actually quite an economically sized package. Aesthetically speaking, this is made completely of cedar with a Timber Shield finish to save it from any and all of the elements, made completely with wood harvested from sustainable forests. 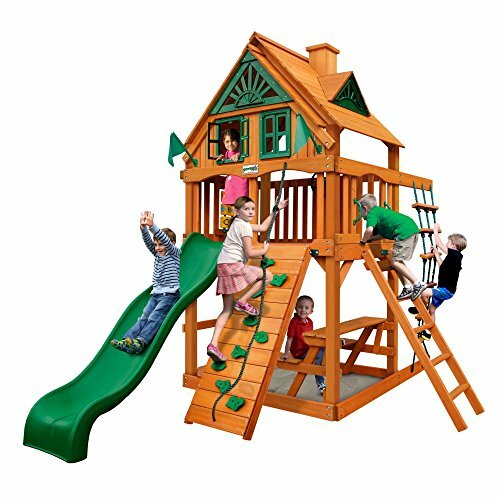 Secondly, this set comes with a slide, a rock climbing wall, a small clubhouse area, rope ladder, picnic table, and many others. It’s a fantastic set for kids as they’ll be able to kill days on end playing on such an elaborate set up. It has a small footprint and is quite aesthetically pleasing as well, which means that this set will work for all members of the family. Again, the price tag may cause a few double-takes, but you get quite a bit for the dollar with the guarantee that this set isn’t going to break down any time soon. It may not be in everyone’s budget, but if you can afford it this is certainly the set to go for. Beyond subjective criteria regarding the aesthetics of a product, there are a few objective criteria that come into play when choosing the best swing set for small yards. Size matters in a small yard, that’s why the first thing to assess before buying is the size of your lot compared to the size of the swing set you like. Defining a small backyard is hard, since every individual may have a different interpretation of small. 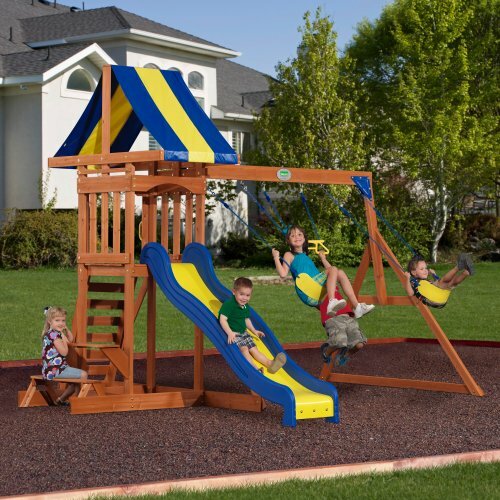 Check out the various swing sets and pick one that can fit securely in your backyard. Secure fit means you should account for a safety zone of at least 6 feet in each direction. Once you’ve assessed the size, you must pick the preferred material. 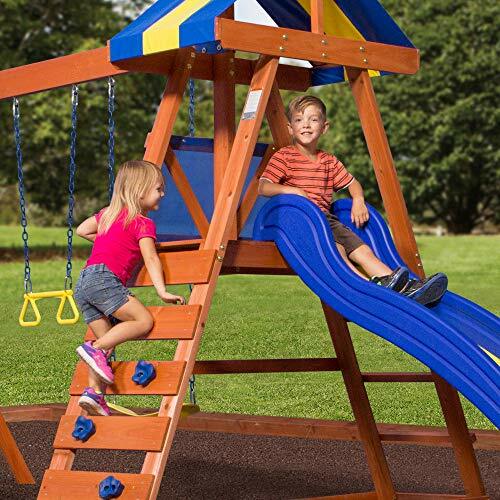 Most outdoor play sets are made from either plastic, powder-coated steel, or wood. Each choice comes with pros and cons, but some options are just better than others. Plastic: Is the cheapest option, and perhaps the best for younger kids, as most play sets made of plastic come with rounded corners and edges. 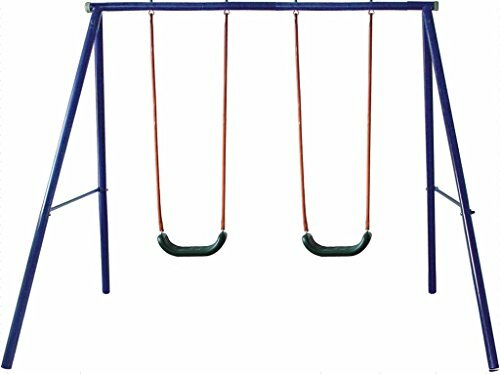 Most plastic swings are made from weather-resistant resins colored in bright hues. 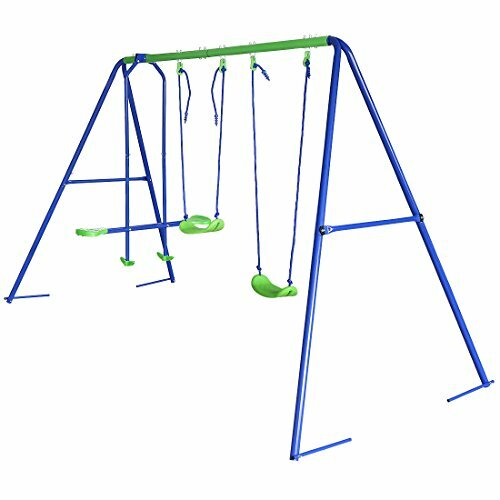 However, even the best plastic swings will discolor over time. This material also tends to lose its strength after being repeatedly exposed to cold and heat, becoming brittle. Powder-coated steel: Is another popular option. 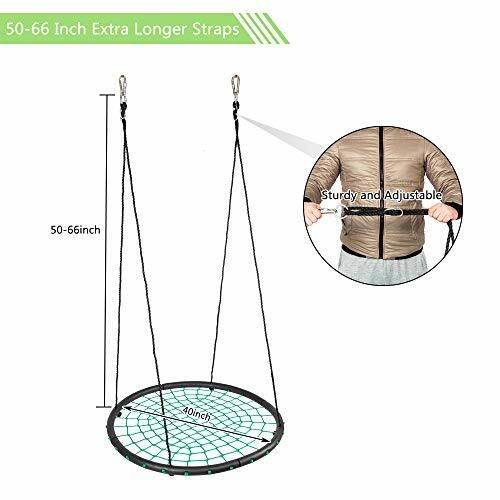 Metal swings are typically lightweight, easy to assemble, and portable. They are also prone to rust, even if manufacturers may claim otherwise. 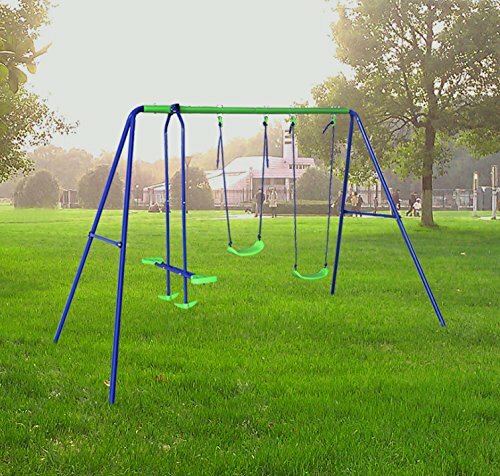 Luckily though, most metal swing sets on today’s market are protected with advanced coatings that minimize the rust risk. Wood: Perhaps the best swing set material, wood is a durable and safe material if maintained well. You can expect a wooden swing to last for years, although it’s unlikely that you’ll be able to move it without dismantling the pieces. Wooden swings are also easy to transform into creative DIY objects once your kids outgrow the outdoor playing stage, so it’s a win-win for everyone involved. Most swing sets come with instructions that allow for a DIY installation. However, you must consider the complexity of the project before investing, especially if you’re not too skilled in such tasks. Some brands may offer professional setup, and while this may drive up the final investment, getting your set assembled professionally is probably the best thing you could do from a safety standpoint. If you want to save some bucks on setup, pick a set that’s easy to put together and dismantle, and follow all instructions to make sure the structure is solid before letting your kids use it. Many swing sets on the market consist of much more than swings. Most of them come with slides, climbing walls, sandboxes, and other add-ons that can easily boost the value of the set, at least from your kids’ point of view. While some sets come with a host of accessories, we recommend the simpler but customizable models. Not only they come cheaper, but you’ll also have the chance to add on only those accessories your kids will love and use. For instance, perhaps you’ll make little use of a sandbox if your kids are older, but a slide or rock wall can entertain children of all ages and for a longer time. Alongside accessories, you must also consider the upgrades. Upgrades of an existing swing set will help you reduce costs as your children grow. Some brands, for instance, let you upgrade toddler swings to belt swings suitable for older kids. Some simple models can also be upgraded by adding rock walls, slides, and houses to an existing swing base. The rule to follow when buying a swing set, therefore, is to think in advance. Anticipate what your kids might want as they grow, and make sure the set you have lets you add on accessories or bring all necessary upgrades so that you won’t have to invest in a whole new set. The best swing set for small yards can bring active summer fun at your home. Whether you’re looking for one made of wood, metal, or plastic, you now know which are some of your best options. Before buying though, don’t forget to check both the size of your yard and the swing set dimensions, to make sure you have sufficient space to install it safely.